Why did the 4 teams in the Rugby Union Champions Cup Quarter Finals win over the weekend? Was there a common denominator? There was (1) heaps of passion at all the venues, and apart from Saracens, (2) a desire to produce quick ball. Why on earth do Saracens persevere with a half-back who jogs to the breakdown, then plays around with it with his foot…oh and then he box kicks? Whenever quick ball was served up, play became exciting and the teams with greater team mobility went forward at pace. Look at the support of the “Irish” tight five forwards around the field, especially those from Leinster! There needs to be some adjustment to ball into contact skills, especially if your opponents have players with proficient jackaling skills at the breakdown. Ball carriers need to begin their movement to place the ball before they go to ground. Scarlets will have taken note of Dan Leavy’s outstanding ability, and performance for Leinster. Finding common denominators when watching French teams play is like predicting the fall of the dice. However, such is the influence of overseas players that maybe some predictability is emerging, let’s hope it is in the willingness to support, because Nakarawa’s try for Racing 92 was a coffee spiller (I leapt up off the settee and spilled my coffee)! The two P’s (Power and Pace) also contributed to winning performances. Passion, not only on the field but off it as well. Crowds can get teams home in tight games. They are the 16th man, and dare I say, they might influence the referee? I once stood on the Kop at Anfield. For 90 minutes you are in another world. If Liverpool attacked the Kop in the second half, a win was inevitable. I always thought pace was something you react to, BUT Conway’s try for Munster defied reaction. He was a bullet from a gun, a blur in the twinkling of a game. The semi-finals are a feast in waiting. Scarlets have ignited the Welsh renaissance this season, with a return to core coaching principles and quality execution. Their semi-final against Leinster in Dublin has the makings of a coaching classic. All the ingredients are in place, the mixture and the serving could be exhilarating. 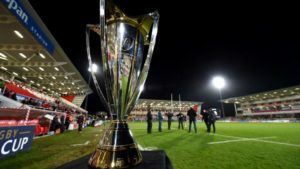 Racing 92 will play Munster in Bordeaux, an away venue for Racing, but the hoards from Munster will make it seem like a home game for the Irish. All four teams will want to play on the front foot, in the face of the opposition in attack and defence. Ball retention, building pressure and composure close to the try line will be paramount! I think Leavy’s talent at the tackle contest will weaken Scarlets defence and create just a little more time and space out wide, plus Ringrose is approaching his best. I think the back 5 of the Racing scrum, particularly, their broken field running in the second half, will get them home.